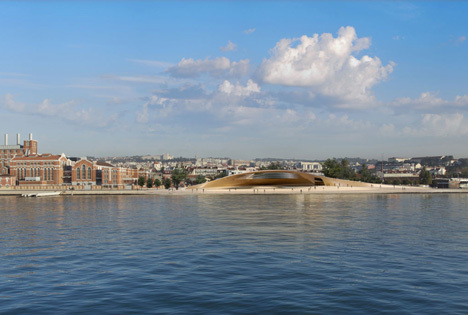 Amanda Levete Architects have sent us these images of their proposals for a new cultural centre in Lisbon with a roof that spirals around from the existing riverfront pathway. Visitors to the EDP Foundation Cultural Centre would be able to walk both around and over the building. A series of steps up from the riverside lead to an entrance for the centre. The site is of strategic importance. 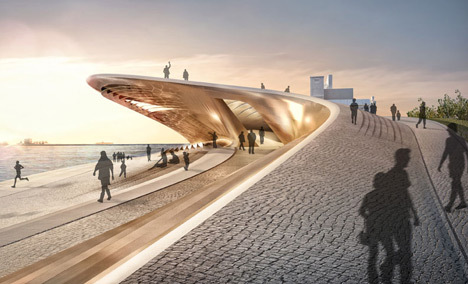 Acting as the gateway to the culturally rich area of Ajuda / Belém, the building will be a magnet, drawing people from the heart of the city to the panoramic views along the Tagus estuary. 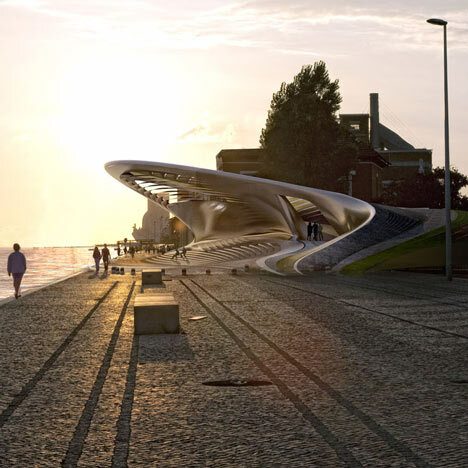 The currently neglected riverfront area will be activated, and the cultural centre will become one of Lisbon's leading destinations. The roof offers panoramic views towards the river as well as across the cultural area of Ajuda / Belém. In relationship to the Museu da Electricidade next to it the building is modest in height. It reflects the horizontal emphasis of the riverfront and is designed to have minimum visual impact on views from the city. Lisbon's rich heritage of complex cobble stone patterns is subtlety reinterpreted and used to merge the existing materiality of the pathways with new public spaces that speak of modernity.